Only 1.5 hours away, this hike just outside NYC makes you feel like you are in another world. Whether by car or by the beautifully scenic Metro North train ride, the Bull Hill (and Little Stony Point) trails are a must-see for those NYC-ers seeking an easy day trip out of the city. By car from Manhattan, it’s an easy 1.5 hour drive to Cold Spring, NY. The town itself is great, with a happy main street lined with little shops and restaurants to explore. 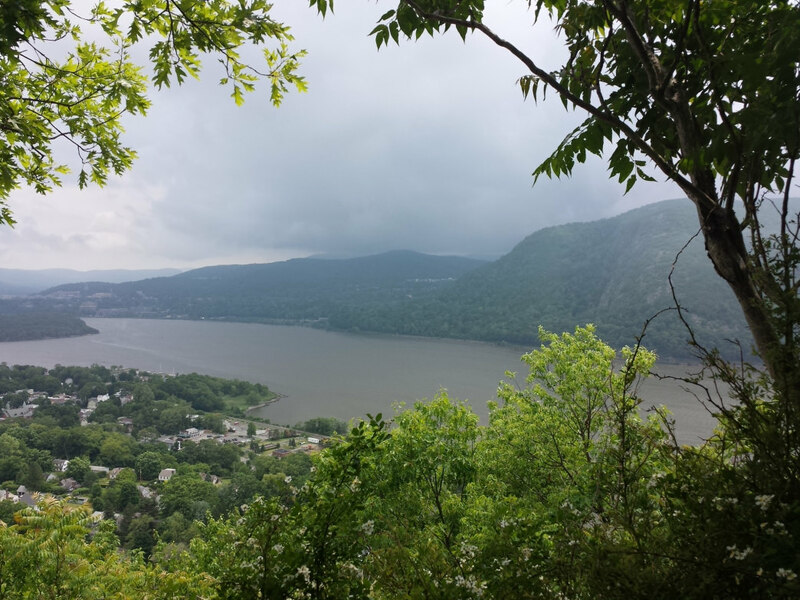 Once you get to Cold Spring, walk the Little Stony Point trail first. This trailhead shares the same parking lot as the Bull Hill trails, and is located directly across the street (on Rt. 9D). Little Stony Point is a chill, quick 1-mile loop with some great beach views. This area can be a bit crowded depending on the time of year, with day trippers enjoying the beach, but rarely does it get so crowded that you can’t indulge in a little solitude. Once you soak in the sights from Little Stony Point loop, you’re back where you started and across the street from the parking lot. At the trailhead for Bull Hill, you’ll find a helpful box of free trail maps at the opening and a decision to either take the Cornish or Washburn trails. Both routes are highlighted on the map and vary in length, from 4 miles to roughly 8 miles round trip. The ascent up is quite steep and rocky at some points, so definitely expect to get a workout. But the views are great and definitely worth the trek. All of the trails are extremely well marked with white, blue, yellow or red markers and the map is an excellent guide. Many points of the Bull Hill ascent are super steep, and absolutely warrant some bragging rights. On clear days from the peaks on Bull Hill you can see Manhattan. If nothing else, the Instagram-worthy vistas of the Hudson Valley and the village of Cold Spring below will be the envy of all your followers! People looking for a little adventure and hikers of all skill sets. The trailhead for Bull Hill is located in the parking lot off Rt. 9D. If you take the Metro North train, it’s the Cold Spring stop. From the station, walk up Main Street and make a left onto Morris Ave (or Rt. 9D). The trail head/parking lot is about 0.7 miles up that road on the right. If you’re driving from NYC, you’ll be traveling the Palisades Interstate to get there (basically one straight road once you’re over the George Washington Bridge). I used a local Cold Spring bar located on Rt. 9D as an address to type into my GPS (as well as a good place to stop post hike) — Whistling Willie’s American Grille 184 Main St. Cold Spring, NY 10515. Willie’s is located about .7 miles up Rt. 9D from the trailhead & lot.